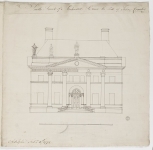 John Crawley (1743-1815) was the eldest son of John Crawley MP (1703-67), who had built Stockwood House from 1740, in red brick, to designs by an unknown architect. The younger Crawley succeeded on his father’s death, and commissioned Adam to make designs for a new house in 1772. Although at least two schemes were devised, Adam’s designs are not thought to have been executed. Large-scale alterations were made to the house in 1862, and then it served as a children's hospital between the Second World War and its demolition in 1964. The estate is now used as a public park. According to Bolton, one of Adam's 1772 drawings for the proposed east front survived at the house at the time of his publication in 1922. The whereabouts of this drawing is now unknown. I am grateful to Elise Naish, Collections Manager, Wardown Park Museum, for her correspondence regarding Stockwood House.